I omitted the fois gras (because it’s a product that can not be produced in a humane way) but otherwise sticked to the classic ingredients for the farce, using the hare’s heart and lungs, some minced pork meat, mixed forest mushrooms and black truffle. 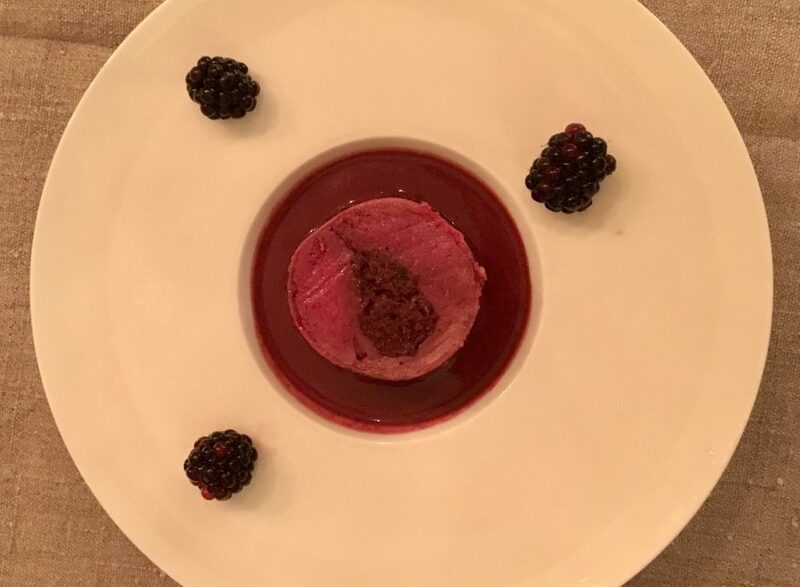 I formed the farce in a cigar shape and prepared it sous vide at 70 degrees C.
Once the farce was cooked and had been chilled, I made a rouleau of the hare’s loins with the farce in the middle and tightly wrapped thin slices of of bacon around it. I then cooked the whole thing sous vide again, but this time only at 57 to make sure the loins wouldn’t be overcooked and turn out dry. The sauce was made from doubly infused hare stock (for which I used the hare’s carcass) and red wine, and thickened with the liquified hare’s liver and blood. The blood I collected during the cleaning of the hare, mixed quickly with soft butter and frozen until use to prevent spoiling. While thickening the sauce I made sure to keep the temperature low to prevent the proteins in the blood from turning into bits of omelet. Once the rouleau had been in the sous vide for 1 hour, I took it out, padded it dry and very briefly sauteed it to crisp the bacon. I plated the meat with homemade pickled beet, the sauce and three brambles pickled in red wine syrup.